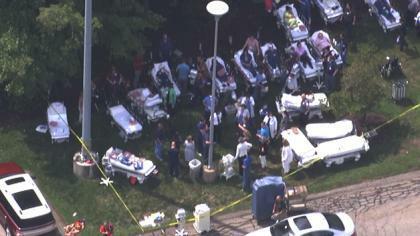 Patients outside of Exeter Hospital in New Hampshire after the emergency department was evacuated. Two sections of Exeter Hospital were evacuated Friday after 19 staff members reported flu-like symptoms in the inpatient operating room, a hospital official said. The cause of the staff members’ sickness at the New Hampshire hospital remained a mystery Friday, officials said. State public health officials who inspected the hospital on Friday had “no findings,” hospital spokeswoman Debra Vasapolli said. “Whatever caused it is no longer present,” she said on Friday night. Between 8:30 a.m. and noon, 19 staff members from the operating room complained of dizziness and nausea and were taken to the hospital’s emergency room, Vasapolli said. Both the operating room and emergency room were eventually closed and evacuated, she said. The latter was closed out of “an abundance of caution,” she said. Six patients were moved out of the emergency room because of the closure, Vasapolli said. Vasapolli said Friday that no patients were sickened. By 8:30 p.m., Vasapolli said “most if not all” of the hospital staff who were sick were released from care. “They’re doing very well,” she said. Vasapolli expected both the in-patient operating room and the emergency room to be reopened to the public by mid-morning Saturday. Patients who were in the closed areas of the hospital were taken to an area outside the hospital doors, where multiple fire departments and ambulance companies dispatched crews to help with what was described as a mass casualty incident. Messages left with the Exeter Fire Department and the New Hampshire Division of Public Health Services were not returned Friday.